The Beaverhead River slides right past Carroll Field, home to the Twin Bridges Falcons. The weather is cool and rainy with some Blue-winged Olives, however, fishing is on hold as the high flying Falcons go into the first round of the playoffs, Saturday beginning at 1:00. Fishing will resume right after the game. 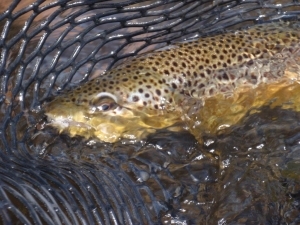 So, look for the soft water on the lower Beaverhead. Pray wind will not be a factor for casting or field goals.